Winter storms cause very bad damage to trees in your yard and garden. Downed or broken trees should be removed as soon as possible. If the damage is minor, such as tiny branch injuries, the whole tree is not harmed. You can easily remove these branches. 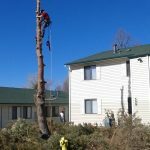 However, if there is severe damage, such as large broken branches, a splitting trunk, or peeled bark, you have to consider whether the tree is worth saving. If it is not worth saving, you must get rid of the tree as soon as possible. Otherwise, the tree will turn to a hazardous tree. Removing a hazard tree is very dangerous to the tree crew and needs special skills, adding to the cost. Check out your trees for damage after a storm. 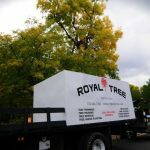 If a tree has hazards, such as broken, hanging limbs or a split branch union, you should have Royal Tree take care of it. This is important because you could be responsible if the hazard branch or tree falls and damages property or causes personal injury.